Western Australian Land Information Authority is a statutory authority that operates under the business name of Landgate. We are managed by a board which is accountable to the Minister for Lands. Here you can find out what we do, our structure, strategies, performance and values, as well as our commitment to community. Western Australians have a spiritual, personal and commercial connection to our land. For the first Australians, connection to the land is an inherent part of identity and culture. For many of us, land and property is the most valuable asset we will ever own. For business and government, land is an integral part of our economy – in mining, agriculture, manufacturing and tourism. Landgate's history can be traced back to Western Australia's colonial days, where land was the most available and tangible currency. Its importance to our identity and our economy remains the same today. Evolving since 1829 from the original Surveyor-General's Office, Landgate became a statutory authority in 2007, heralding a new era in location information in Western Australia. Since then, while retaining our purpose as the guardian of property ownership and custodian of WA's location information asset, Landgate has set about commercialising its offering to deliver a broad range of products and services to West Australians – providing even greater benefits to the State. While we focus on delivering our core business, Landgate has also become recognised in the public and private sectors for its leadership in innovation and customer service. We are constantly looking at ways to improve, to give our customers and the community an even better experience and offering. Landgate is the guardian of property ownership in Western Australia and is the custodian of the State's location information asset. 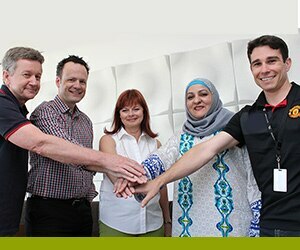 Our role underpins the economic security and prosperity of the State and citizens of Western Australia. We provide a secure land titles system, impartial land valuation services and authoritative location information – all vital to the Western Australian property market and the State's economy. We are the State's trusted and respected source of location information, helping to inform important decision-making in government, business and the community.